Do you ever see something then can’t get it out of your head? That was me last week. 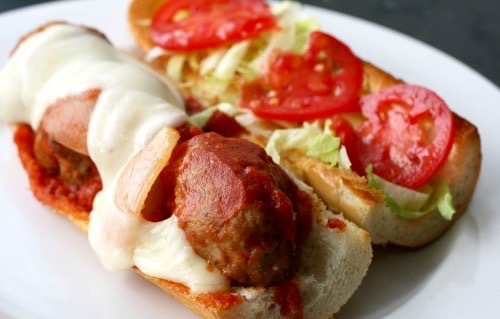 Famous cookbook author David Lebovitz posted a drool worthy Meatball Sandwich recipe. After I bring Sasha to school I like to enjoy my second cup of coffee while going through my Google Reader. David’s meatball sandwich had me craving saucy meatballs at breakfast. At this point I knew I wasn’t going to be able to shake those images of meatball subs until I made my own. The only hitch was I am doing this super fun thing called counting calories (check out My Fitness Pal it makes it easy) and I knew there was no way I would have enough calories for a meatball sub made with beef & pork sausage. I needed to come up with a leaner version that wouldn’t break my calorie bank. Hence the turkey meatballs you see. Don’t worry, these were still incredibly flavorful. My girls who don’t really groove on ground turkey raved about how good they were. Heh heh they didn’t know they were eating ground turkey. 🙂 Although Sasha did tell me that I could have used more garlic because she really couldn’t taste the flavor of it very much. So take note, my six year old recommends more garlic. In a large bowl mix together all ingredients until evenly combined. Roll meat mixture into 16 golf ball sized meatballs. Place on parchment lined baking sheet. Bake for 10 minutes. Turn meatballs. Bake for 10 more minutes. Place meatballs in your favorite marinara sauce and simmer over medium-low heat for 10 minutes. Cut baguette in half and pull out the soft bread from both sides. Cut two meatballs in half. Nestle the meatballs in the groove on one side of the baguette. Drizzle some of the marinara on top of the meatballs. Top with your favorite cheese (I used provolone). Slide under a high broiler until cheese is melted and baguette is crisp. Top with lettuce, tomatoes, onions, peppers, whatever suits your fancy. Enjoy!